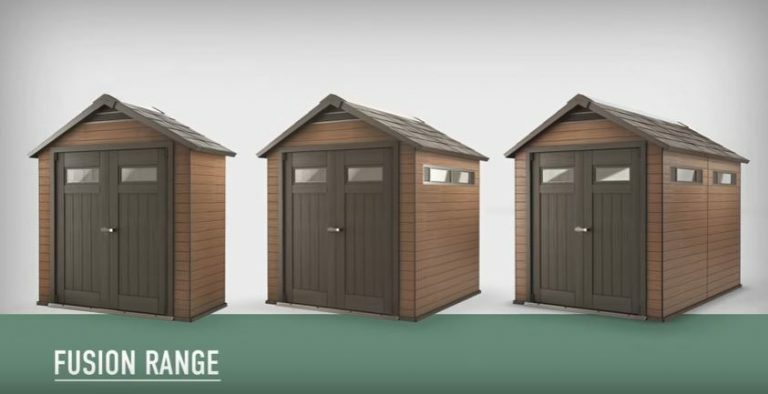 Keter Fusion’s 7ft composite outdoor storage sheds exhibit the tradition of a wooden storehouse braced with the durability of weather-resistant resin, courtesy of amalgamating the two materials together. If desires prefer the charm of a wooden structure and wish to sidestep maintenance, Fusion’s design & manufacture may fit the bill. The benefits of combining wood with polypropylene results in a fascia immune from decomposing, irrespective to stationing in a continuous damp location or suffering persistent rainfall. Fusion sheds don’t require conserving with annual re-coats of wood-stain in order to uphold appearances and preserve, their mere necessity once the grime becomes noticeable is to deliver a wash. If it wasn’t for this occasional freshen-up, we’d be terming these sheds as maintenance-free. Revitalizing appearances is pretty swift too. Either a light pressure-wash or as we do, a jet-shower down with the hosepipe. Now & again our resin shed suffers moss & sap stains from nearby trees, however, we find these are quickly scrubbed away with a soft brush dipped in warm water & mild detergent. White vinegar works well too. The foremost importance when freshening-up resin fascias are to avoid using abrasive cleaners to prevent scratches from appearing, therefore a soft-ish brush is the best option. Fusion’s manufacture combines recyclable polypropylene with wood, further to stabilizing the composite with UV protection for the purpose of resisting sunburn fractures and bleaching. Each panel is formed into two layers, comprising an internal & external skin joined together by a ribbed inner section further to creating tongue & groove edges in order to streamline assembly, they simply slot & slide into place. Fusion’s moulding procedure simulates the mirror image of wood, courtesy of producing textured grain therefore when you run your hand over the surface, there’s a distinct feel of wood. Presently unequalled in the resin shed world, Fusion walls cater for screwing into, you can install shelving and hooks. 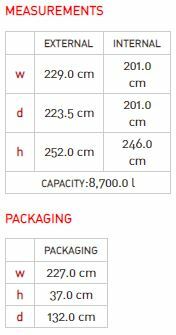 Each wall section has a weight limit of 77 lbs / 35 kg, each screw has a weight limit of 8.8 lbs / 4 kg – wood screws only, no nails. Scrutinizing feedback, the fascia is fab for installing hooks for hanging gardening tools against the walls, however, the shelves weight limit leads most people to assemble a bank of free-standing shelves for accommodating weighty gear. 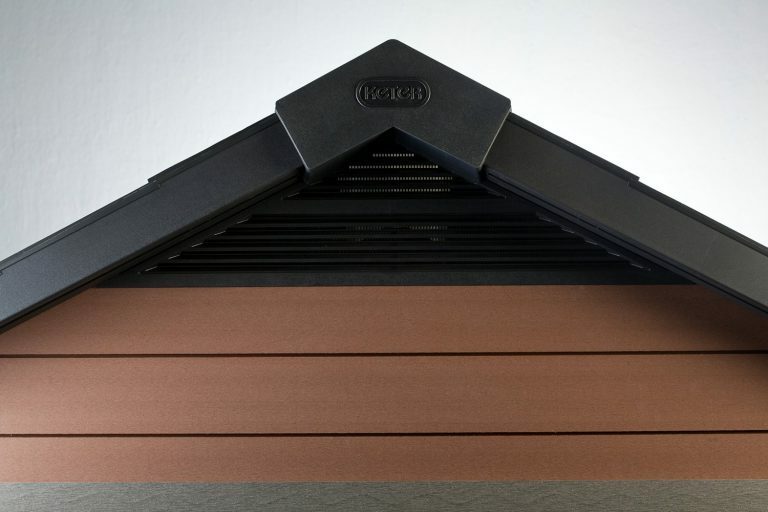 The roof is formed into 4 sheets manufactured from reusable polypropylene, shaded the colour of slate & formed into a double lining meanwhile a 3D moulded procedure creates a classic simulation of slate tiles, admirably crowning the shed off. 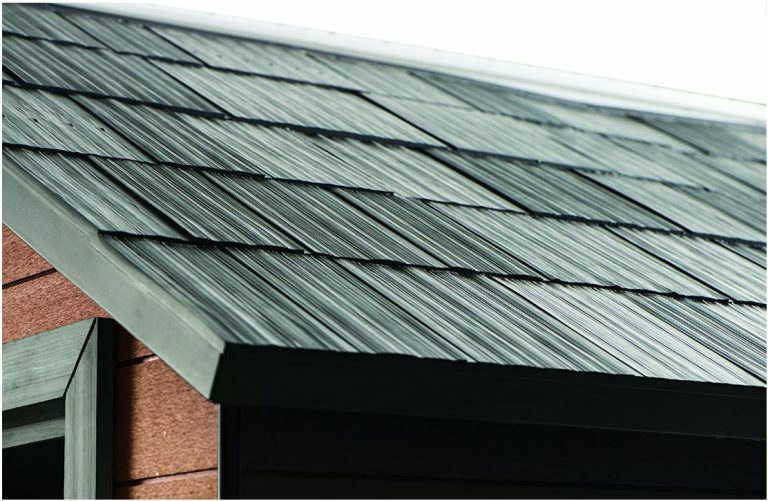 Fusion’s steep apex peak ensures instant drainage meanwhile to prevent rainwater from dribbling in, the walls favourably abut underneath the roof structure. Fusion’s steep roof-pitch reciprocates a 2.46-meter internal ceiling height to overcome ducking down, an adult can leisurely walk around inside. A corrosion protected A-frame steel truss installs centre-stage of the roof structure and secures to the roof sheets with screws, providing sturdy-steel reinforcements. Couple the A-frame with two steel supports positioned front & rear, Fusion’s boast significant snow-load support. In contrast to the disintegration problems of roofing felt, polypropylene continues-on unaffected by decay, therefore, you won’t be subject to replacements a few years down the line. Daylight brightens the interior through shatterproof polycarbonate wall & door windows and a full-length roof skylight. 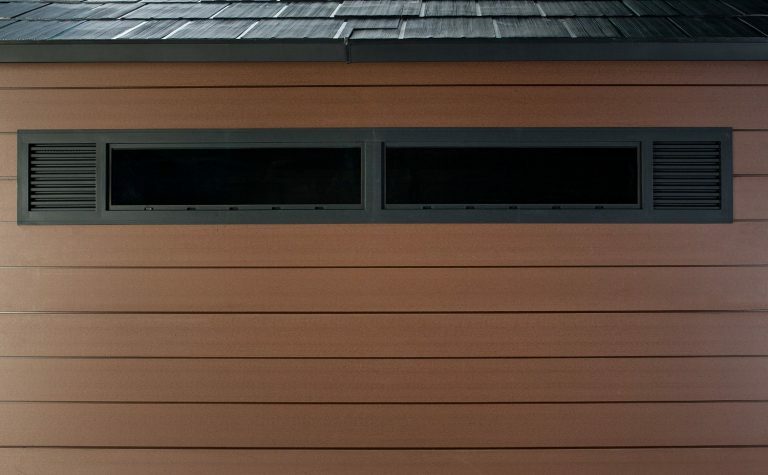 The windows rectangular design & high position delivers privacy for storage. Ventilation grids are located on the front & back besides being positioned either side of the window, these generate a continuous stream of fresh air to overcome saturation during humid conditions. The floor is manufactured into a thickset toughened polypropylene base to subsist tractor stresses meanwhile each panel interlinks to form the base area simultaneous to interlocking with the fascia, thereby enclosing the shed. Integrating a floor this way keeps the internals clean & dry, stops pests from entering & leaves wafting through. We find this highly beneficial come Autumn’s fall. Twin muscular looking doors manufactured from a twin lining of charcoal shaded polypropylene & moulded to represent wooden features open-up to provide broad access for gardening duties; wheeling the lawnmower inside is aided by a sloped entry threshold. 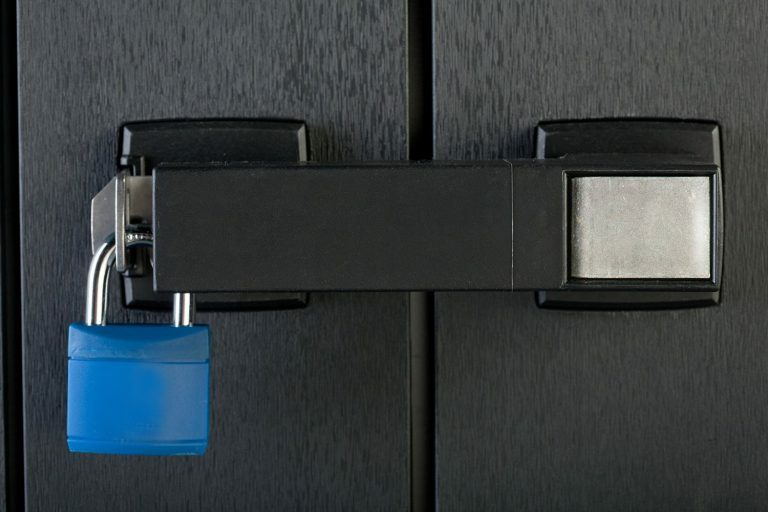 The doors are operated by a stainless steel locking system; the pad-lockable handle clips into position to close & lock. Fusion sheds have to station on solid level foundations. Anchoring down to the ground is advised to dramatically increase wind resistance levels. 8 anchor placements are indented in the floor. Foundations for a 7 ft shed can be wood deck boards, paving or concrete, including tarmac & asphalt with the emphasis on preparing the platform level. Solid ground is important for the floor to subsist hefty lawnmower manoeuvres whereas constructing from a levelled base results in a perpendicular building, absent from leaning stresses. These sheds take 2 people to construct, using household tools. Aligning these composite panels with the steel framework is designed straightforward owing to their tongue & groove edging. 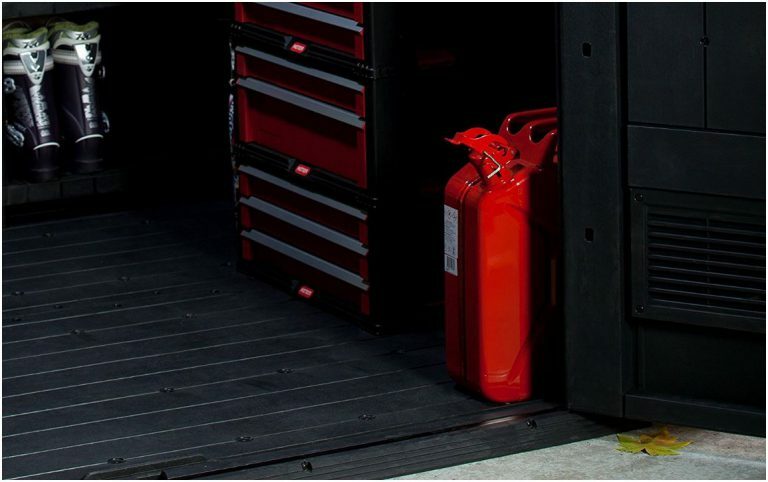 Feedback comes across very favourable in the UK, however, in America it’s averaging around 80/20 due to poorly handled deliveries containing broken parts. A few mentions, Keter need to improve quality control. If you decide upon a Fusion shed, my advice is to NOT accept any broken parts or defaults. I would contact the seller or Keter immediately and ask for a replacement, I certainly wouldn’t try to rectify anything delivered broken. Fusion’s composite fascia exhibits traditional charm, armoured with resin’s resistance to decay meanwhile stylishly topped off with slate-style roofing, twin lined doors and toughened floor manufactured out of polypropylene ensures the entire construction is not susceptible to rot. 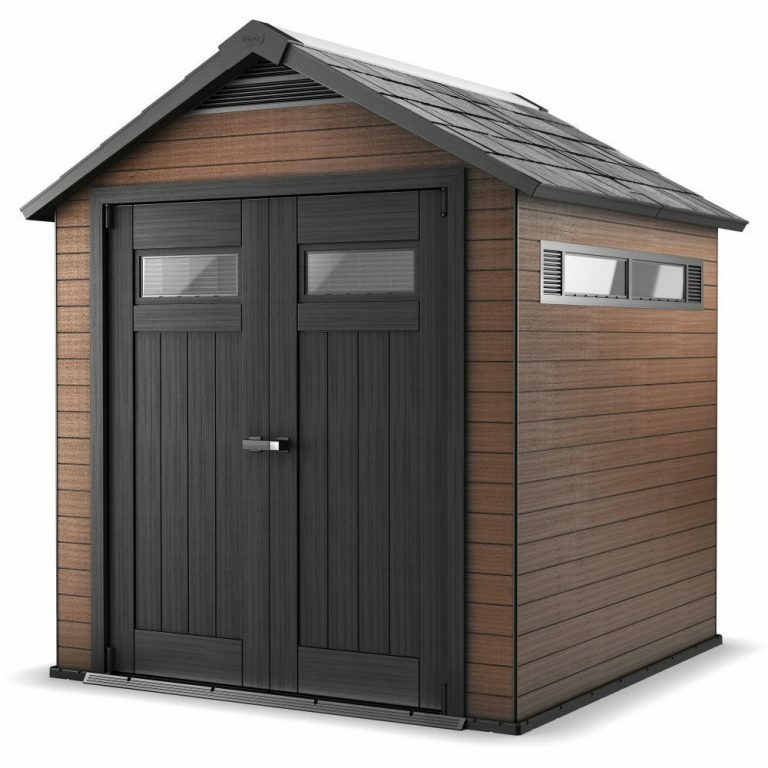 Maintenance merely entails an occasional wash.
3 sheds complete the Fusion family, they all comprise the same width & height. This shed stands in the middle, the smaller store stretches 4 feet, the larger model spans 9 feet in length. 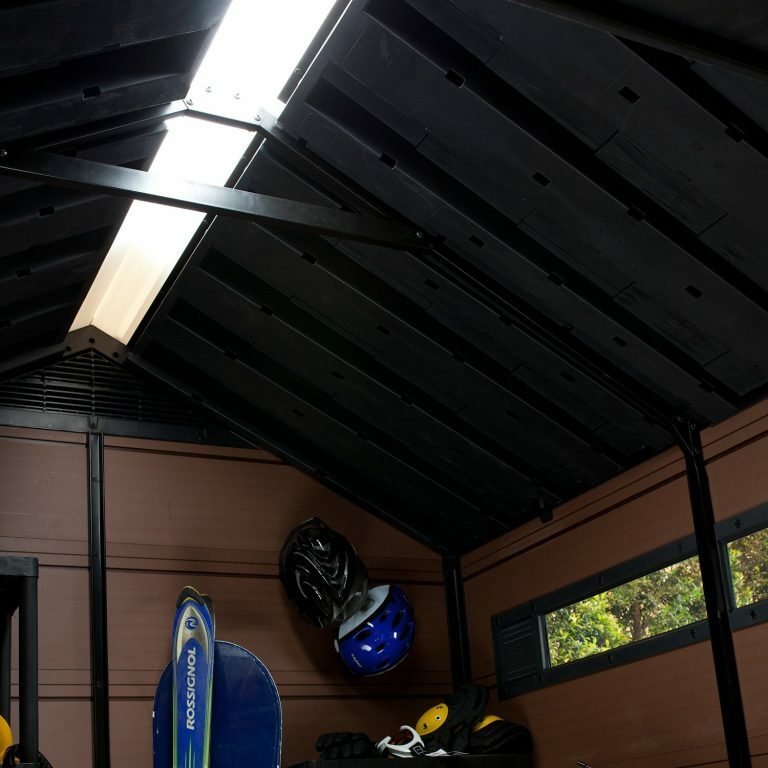 Thanks for reading about Fusion’s 7 ft composite outdoor storage sheds. Please share Fusion’s 7 footer. Thank you. What a great post. 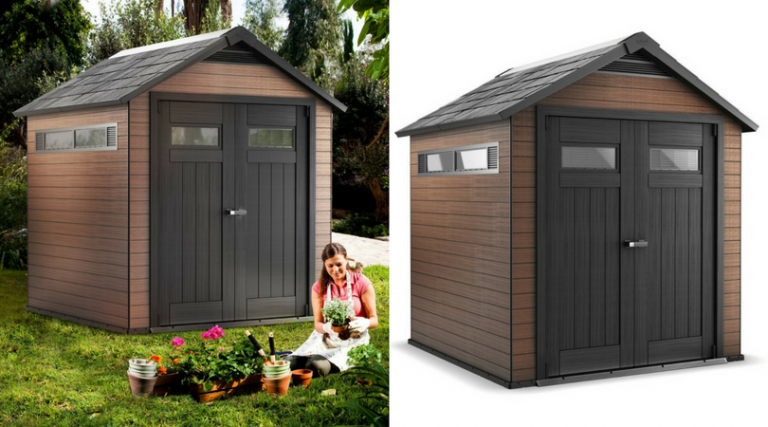 This is especially helpful for me because I have been looking for a more affordable option for an outdoor shed. The house I just purchased is lacking any storage buildings and some of the sheds I have seen are extremely expensive. I will definitely be looking into these sheds further. Thank you for sharing. Hey Shyla, thanks for inspecting what Fusion sheds design delivers in terms of size, value & manufacture. There’s a whole variety of different sizes & styles competing with Fusion sheds, some offer more reasonable value too especially those lacking slate-style rooftops and enhanced add-ons. I would describe Fusions design at the top end of the spectrum in terms of price, this is due to combining wood for traditional appearances with polypropylene for rot-resistance, resulting in a shed exhibiting stylish looks and delivering extremely low maintenance. All the new-build homes in the UK, where I’m from lack storage room. There’s a new estate around the corner from us whereby every garden contains a shed for storing outdoorsy gear owing to insufficient storage room indoors. This seems to be a growing problem most of us are encountering nowadays, especially with the amount of stuff we keep accumulating; we’re no different. Shed Ranges explores Fusion’s competition which may be of interest. Great article. We’ve needed to replace our old 70’s era metal shed since Hurricane Irma took half of it last September. The anchors held great, but Irma shredded the rest. Cleaning up the twisted metal remains was tedious work as you had to be careful not to cut yourself. I really like the looks of this one and I think the materials would do really well down here in Florida. Hey Susie, thanks for calling in to research Fusion’s composite style of sheds after Hurricane Irma destroyed your last metal designed one. Unfortunately, neither wood, metal or plastic sheds will survive hurricanes & tornados, they’re all designed to anchor firmly & sufficiently but when the hurricane winds attack the sides there’s little that can be done. I can imagine clearing up twisted metal is rather dangerous with regards to cutting yourself, best to wear some thick protective gloves for that job. Bet you lost all your storage too, what a shame. Fusion’s material combines wood with polypropylene whereby the resin results in a manufacture resistant to rot meanwhile UV protection stabilizes the make-up to combat the heat of sun rays blistering, fracturing and bleaching. The cleaning process of a light pressure water wash down delivers a speedy freshen-up and that’s pretty much it for maintenance, however, no shed can be described as hurricane-proof. This storage shed looks awesome! I don’t think there is a single detail you’ve missed in this review. To say that now I know plenty about sheds will be the understatement of the year! Hey Boryana, thanks for visiting to check-out Fusion’s 7 ft shed. Fusion composite sheds contain a lot of features, some unique to Keter’s manufacture too, I like to try and present all the information visitors require to make an informed decision whether this style suits their garden, storage & circumstances. I think the best features really are presented in both videos as you get more of a realistic view, seeing the shed in a real-life situation. I’ve included a video demonstrating Fusion’s features whereas the assembly video towards the foot of the page provides a full insight into how these sheds are installed, they’re worth watching. I tried clicking on the shed I was interested in, and it brought me to another page of your website. I was unable to find a link to purchase the shed, do you provide that anywhere on your website. My email is below if you could let me know. Thanks! 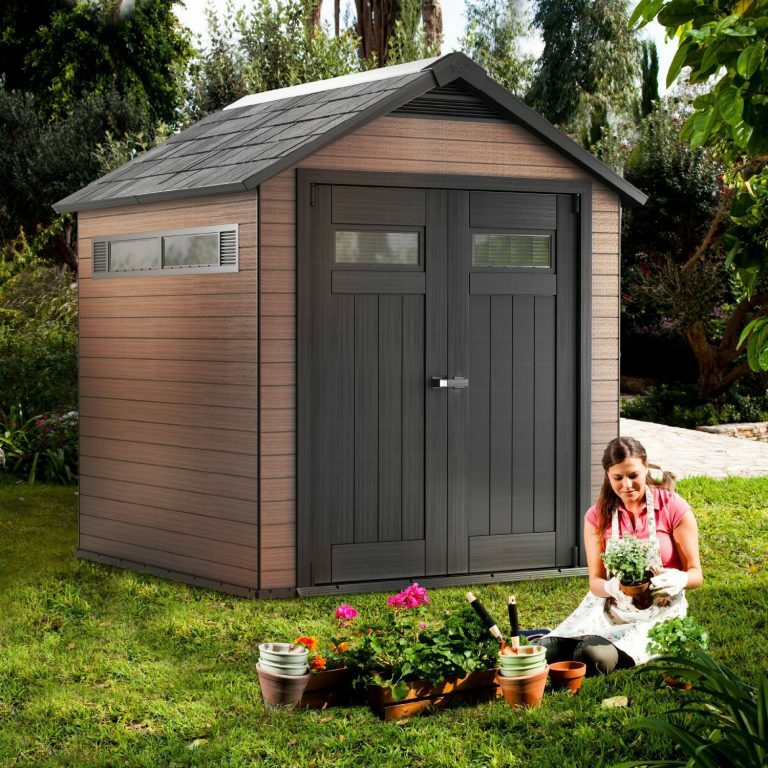 Hi Babsie, thanks for checking-out Fusion’s 7 ft composite storage shed. 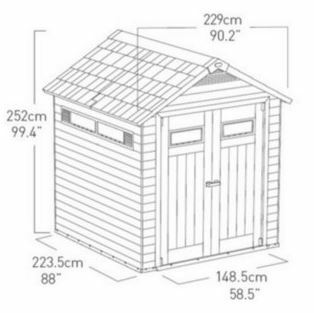 The links to purchase sheds are presented by the green ‘View Prices’ button. This opens up another page where I link to prices in the UK and USA. The reason I place price links on another page is that many articles link into the same prices page, this delivers convenience when updating links to ensure I’m linking to the most competitive prices plus I don’t wish for any posts to contain affiliate links to be honest, then the website’s never considered as spam. Thank you very much for this instructional article. 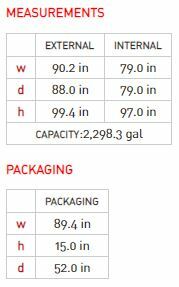 I love the videos and the exact measurements of the materials needed. 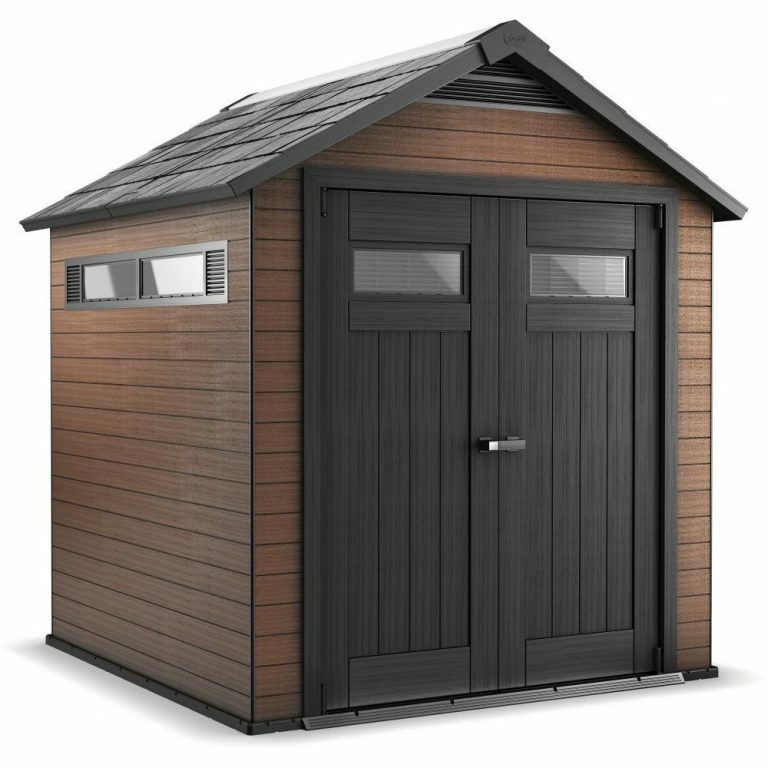 Hi Che, thanks for visiting to read about Fusion’s 7 ft composite outdoor storage sheds. I’m glad you found the review informative, I try and include all the relevant information and measurements to help visitors fulfil their research and make an informed decision whether the shed-style suits their circumstances & location. Keter’s recent shed promotional videos are excellent, I always embed them into articles as they visually demonstrate the features much better than my written words. The assembly video is very thorough and gives you a full insight into what’s involved during installation. Their main priority is ensuring the shed stations on solid level foundations, building vertically eases aligning the panels.